We came across one such game (in discounted section of-course 😋) called Magnetic Mikado. Now Classic Mikado is a game that is played with wooden sticks and has points system based on color of the sticks. 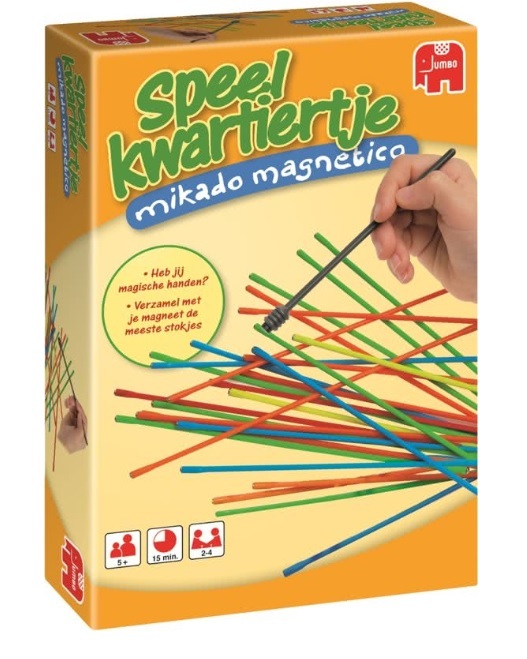 Magnetic Mikado on the other hand is a simpler version more suited to younger kids. We have bunch of colored sticks with metal tips at both ends and a special black stick with a magnet at one end. The objective is to just throw the colored sticks randomly on playing surface and then use the magnetic stick to pick one at a time without moving any other stick. Me and my daughter play the simplest version where the turn changes as soon as one disturbs any stick other than what you were picking up. Once all the sticks are finished, whoever have the most wins. You can even assign points based on colors and then total at the end of the game. So far we have been playing it for 2 weeks now and its a life saver in the current days when my daughter is at home sick. I would like to think it enhances focus and sense of strategy in my kid, however at 4 Euros (available for <300 Rs in India) it is an affordable clean game to engage with your kids or even adults. A clean nose and normal unobstructed breathing is one of the most necessary pre-conditions for proper feeding of a baby. Any excessive mucus AKA "Booger" may prevent baby from breathing freely and thus affect the feed, especially from mother. The most usual sign of excessive booger is that you can hear your baby breathe (a little like a piggy sound) or you actually see something filling up baby's nasal passage. 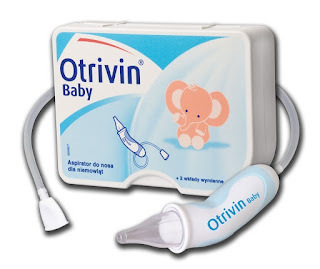 Now its impossible to ask baby to voluntarily sneeze for you, and it is not advisable at all to put any foreign object, such as cloth, tissue or earbud in baby's nose to attempt a cleanup. Nasal passage is sensitive area with a lot of veins and it is very susceptible to bleeding if something scrapes against the inner walls of nose. Here comes the baby nose cleaners to rescue. 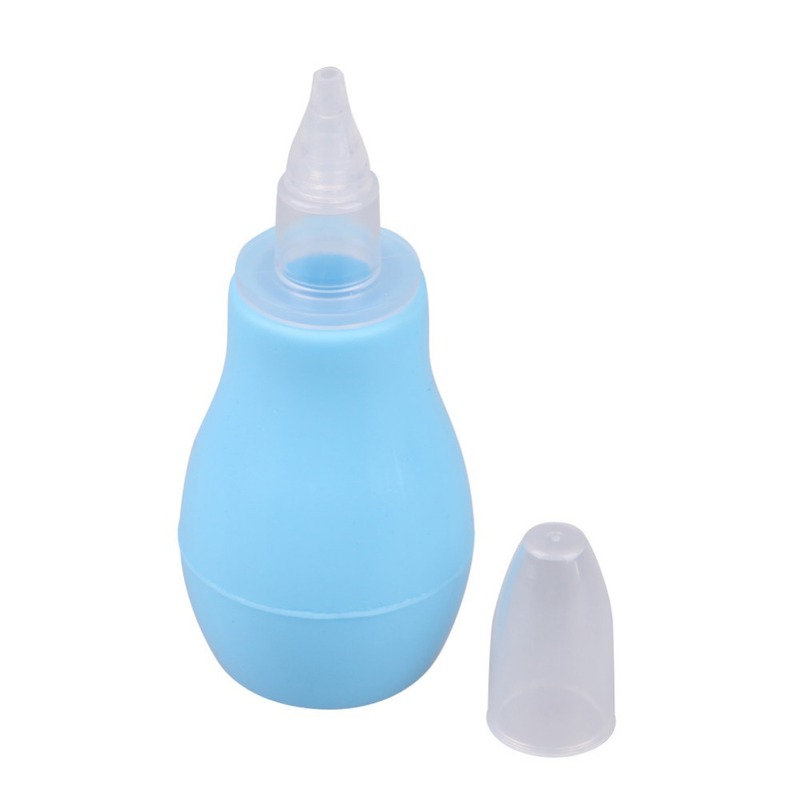 I came across two types of cleaners, both have a smaller end to be put in baby's nose, first one (Type 1) has a little balloon (to create suction) at the other end, while other one (Type 2) has a long tube with a mouth piece at the end that you need to create suction. Type 1 seems to be very low on suction and thus I never tried it. I use the second type and it is quite effective. At first I was a bit skeptical of how much suction to apply. However in order to reduce the suction pressure I use a little piece of cotton between the tube and front nozzle. It has helped a lot of times when my baby was cranky and not accepting bottle or breast milk, and it generally turned out the nose was blocked. The company says that you need to change the nozzle every time you use it, however that just seems a way to sell additional nozzles. Its plastic and can very well be cleaned by putting it under running water, or using an ear bud. 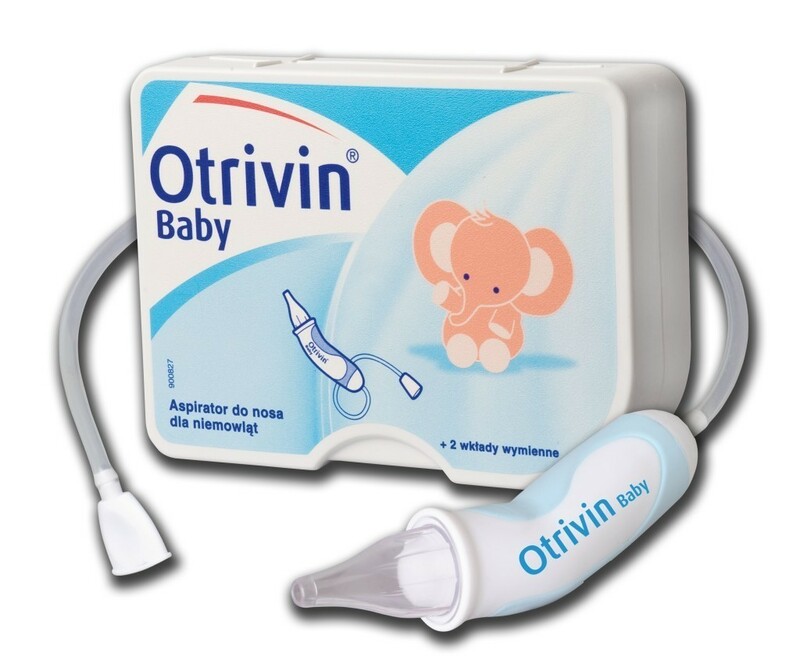 So if you have a baby with cold or with blocked nose, it is a godsend little device to use. Watching a movie or even having a conversation with your spouse once kids are asleep is one of the few things parents live for (Apart from their kids ofcourse :p). Making sure that your kids are asleep and you can hear them in case they need you is a huge relief. Baby monitors come to the rescue here. These are devices which usually have two instruments, one transmitter and other receiver. You can place the transmitter near your baby and take the receiver with you to another room/floor in the house. Baby monitor will ensure that you hear immediately if you kid makes noise. There are lots of types and versions of baby monitors, audio, video, radio based, DECT based,wifi enabled, with camera etc. The main purpose of a baby monitor is to indicate to you when you need to go to your baby. Thus video baby monitors may be a bit too much information when sound or light indication would do perfectly fine. I was planning to buy Phillips AVENT SCD560/10 (close to 80 Eur - >9K INR - Amazon), however a friend lent me his Motorola MBP 8 (30 Eur - 3.6 K INR - Amazon) and I must say I am mighty impressed. In case you live in an apartment and have all rooms on same floor, you don't need to spend anything more than what you may pay for MBP 8. 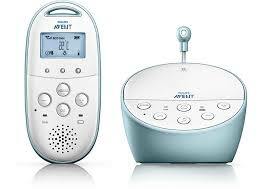 It is DECT based audio monitor and thus there is no radio static or disturbances, only pure sound from your baby's room. The downside is that it can only be plugged directly to wall electricity point. Still the connection is fast and clear. The sound may be a bit on the lower side however the lights make up for it. Also I checked the range from my houses corner to corner and did not find any trouble hearing the sounds. However based on the online reviews the performance of MBP8 degrades significantly when you try to place receiver and transmitter on different floors. In this scenario i would recommend going for AVENT SCD 560/70/80. It is a well tested and excellent performing audio baby monitor with an impressive range. It also give you certain additional features such as talkback and music. 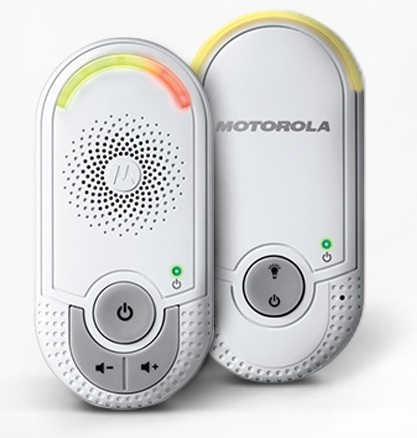 So in case you were thinking of buying an expensive Baby Monitor for use in a single floor apartment/house, try the Motorola MBP 8. You will be surprised by the performance it affords at less than half the price of competing monitors. Children can be tough to engage in boring situations like taking a flight, waiting at an appointment or just doing work at home when you can't play actively. They need an activity that can hold their attention and in the interest of their eye sight, we can't just let children watch TV for as long as they please. Reading story books can be one way, however this may get tiring for you after a certain time. Thus we needed another activity which is not noisy and is simple enough to be done in any setting. 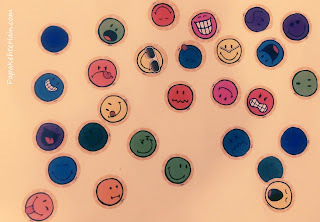 We came across a family member who used sticker books to engage their child. 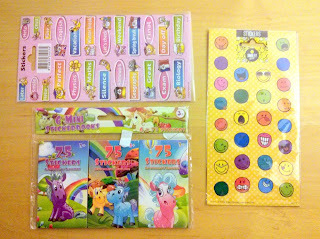 These are books with lots of stickers and lots of places to put those stickers. And I must say the idea has worked brilliantly. Tweety has taken to stickers very well and has a hobby now to create cards for her friends using stickers on coloured paper. The good part is that it is a very affordable hobby which is easier to clean up as well. 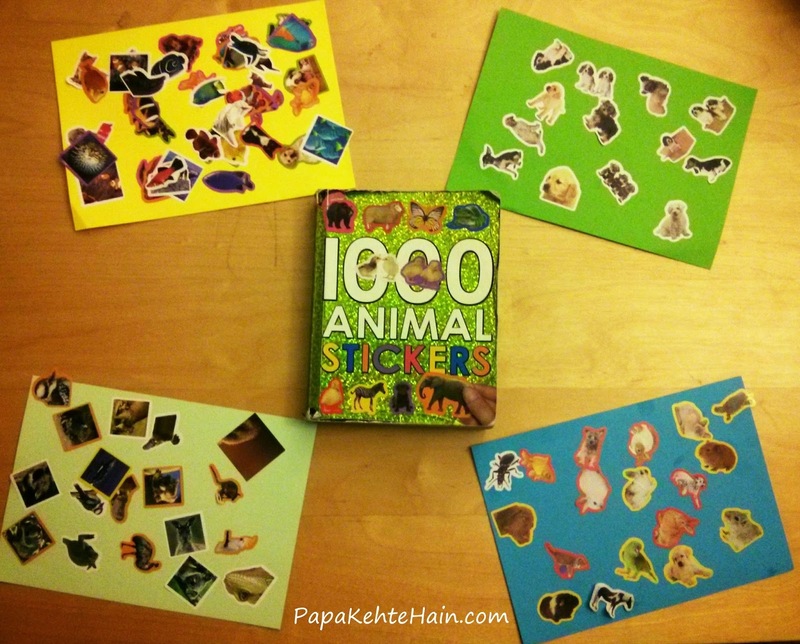 We have got a animal sticker book which is the main source of engagement. Additionally we keep getting small packets of assorted stickers regularly and use them when the book seems boring. She has a free hand to paste stickers in her book, high chair and toy rack. 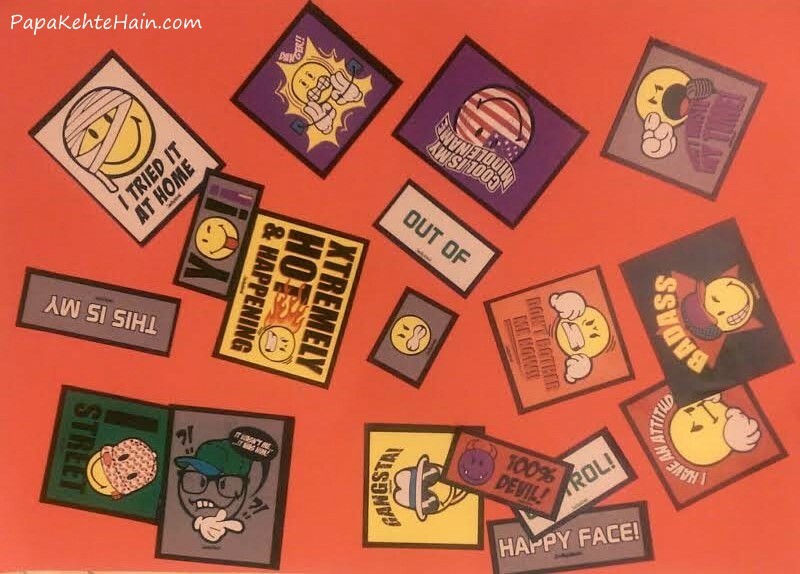 Please make sure to get good quality stickers with light pasting gum so that they can be removed easily if needed. Do share if you have any other simple and interesting activities to engage a child. Learning to balance on two wheels is an important milestone in a child's growth. 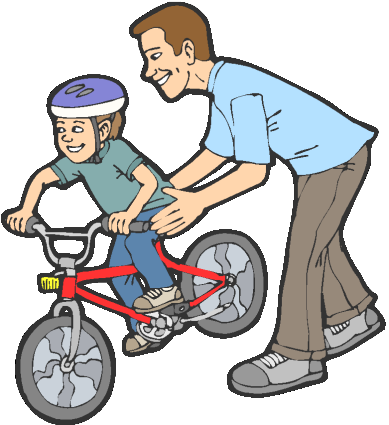 As a parent we would love to see our little one enjoying the fun of riding a bike. But usually it is a steep learning curve for the child, full of falls, scares and refusals that a parent puts up with in the process. As Tweety turned 2.5 we started searching for a way to make her learn bike. The smallest available bike is just about right for her size. However i did not want to go through training wheels as these are easy to use but very hard to get rid off. Training wheels give you a false sense of assurance that you will never fall and thus the child hardly is able to learn balancing. Once the training wheels are removed you are almost starting afresh with learning and go through a few falls. Having seen a few parents in our friend circle struggle with Training wheels, we wanted to start with something different. Then one day, we saw a little kid sailing past us on a busy crossing on a bike with no pedals (With his parent walking besides off-course! :)). The kid was no older than 3 or 3.5. He was just moving the bike with his feet touching the ground at regular intervals but mostly he was gliding with both feet up. It was a wonderful way to start learning. 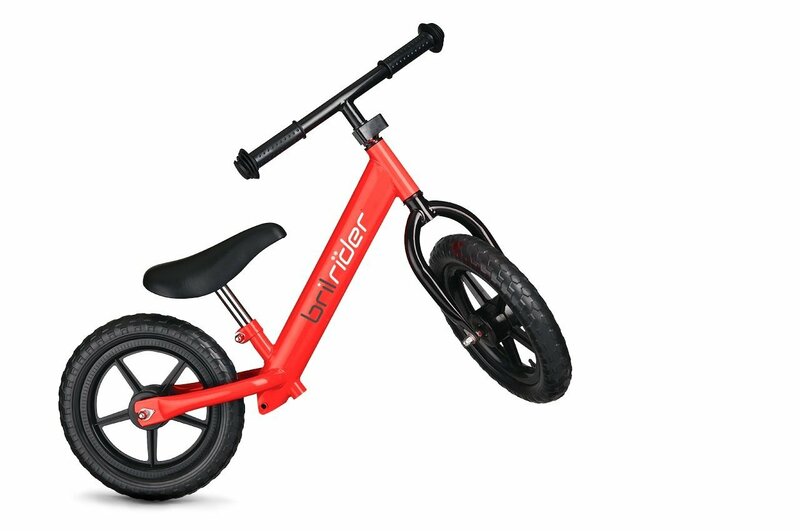 So we searched about these pedal-less bikes for kids and were amazed to find it is actually a great alternative to training wheels. We found out that these feet bikes help a kid get the hang of using a handle, a brake and balancing on two wheels all the while having the safety of feet touching the ground. There is still a chance the child may fall but its is far less likely as compared to a pedal bike without training wheels. We have had the bike for less than a few weeks and we already see Tweety happily taking her feet up in the air for a few seconds in-between. We have the bike from FirstBike for Tweety and it is quite a safe model for kids. 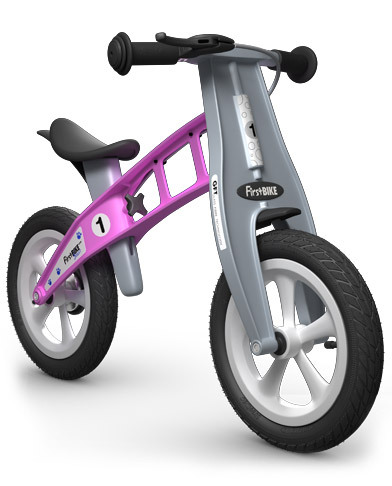 It is a light weight bike with a frame designed specially to prevent injury to child in case of a fall. The handle bar has limited turning capability to ensure that child does not topple because the handle turned all the way. However this is an expensive option with new bikes starting at over 100 Euros (Rs 7000/-). Also in case you are unable to find a pedal less bike, You may get pedals removed from a normal bike as well. Please try to ensure that the handle movement can be restricted to at least half of full movement. These bikes are also called Balance Bikes and are available in India for around 3000/- to 4000/- online (Amazon ). You may check in local cycle markets and it may be available for a lot cheaper. Having read a lot of positive review from all over the world about the benefit of starting with a pedal-less bike, I am sure Tweety will be able to manage well when the time comes for pedalling. Try it and let us know if this was helpful. Sooner or later every child realizes the artist within. And then begins the inevitable scrawling on walls, books and passports (oops!!). Starting to draw is an important step in a child's development as she learns new shapes, objects, animals and especially colours. Soon you get graffiti across the house on every possible piece of paper, furniture and walls. All these are part of growing up, however you can introduce your child to the stories which teach her to draw or write only on papers, but this is easier said than done. 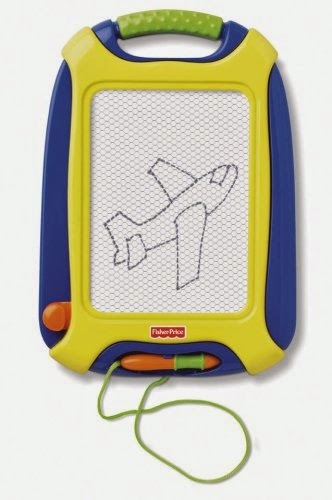 A magnetic drawing board can be an excellent substitute for Pen/Paper. Your child can draw to hearts content and all can be erased with a simple swipe of the inbuilt magnetic strip. 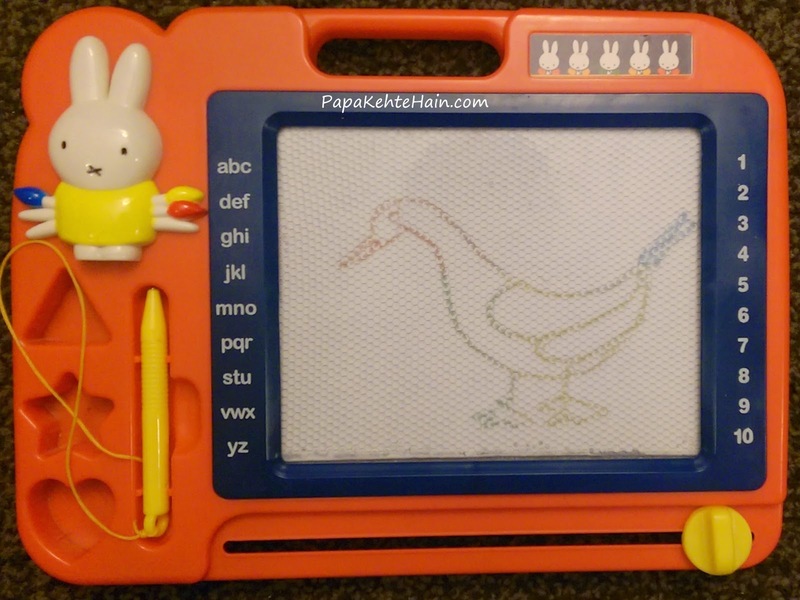 Please ensure the board is of at least 7X7 inch in size as otherwise it is pretty much useless to draw anything clearly and child loses interest quickly. We got the following board and it is serving us well for last 2 months now. Yes.. I drew that bird! If you want to learn how this works then click on this link. Agreed that unlike paper, it is not a good tool for creating memories but it was a great way for me to bond with Tweety as I taught her the difference between a circle and a line or tried my hand at drawing all the animals she asked for. Tweety is about to turn 2 and a lot has changed since the last post on PapaKehteHain. We have moved to a new country and due to the cold weather, Tweety needs to remain mostly indoors. Books, blocks and puzzles are her closest friends right now. Picture/story books help in stoking her imagination and giving her new words to learn each day. Puzzles keep her engaged in a constructive activity. While blocks are just too much fun to stack and destroy. We have brought a big boxful of Hindi and English story books which keep her company everyday while eating and before naps. An Ideal book for this age would be a short story with less words and colourful pictures. Will have a separate post about the books. Now puzzles and blocks are some of the most constructive activities a toddler can engage in. Tweety still has not got the hang of usual puzzles with 4 or more pieces, however she has developed a strong liking for the wooden ones. We recently got above wooden puzzle for Tweety. The different shapes in the puzzle help her recognize new things. The fact that most of the shapes can be only fit in one way, gives her concept of rotation to fit things. Within a couple of days she was correcting our intentional mistakes. Last week our friends gifted Tweety a clock shaped wooden puzzle which is even better in terms of play and learning. 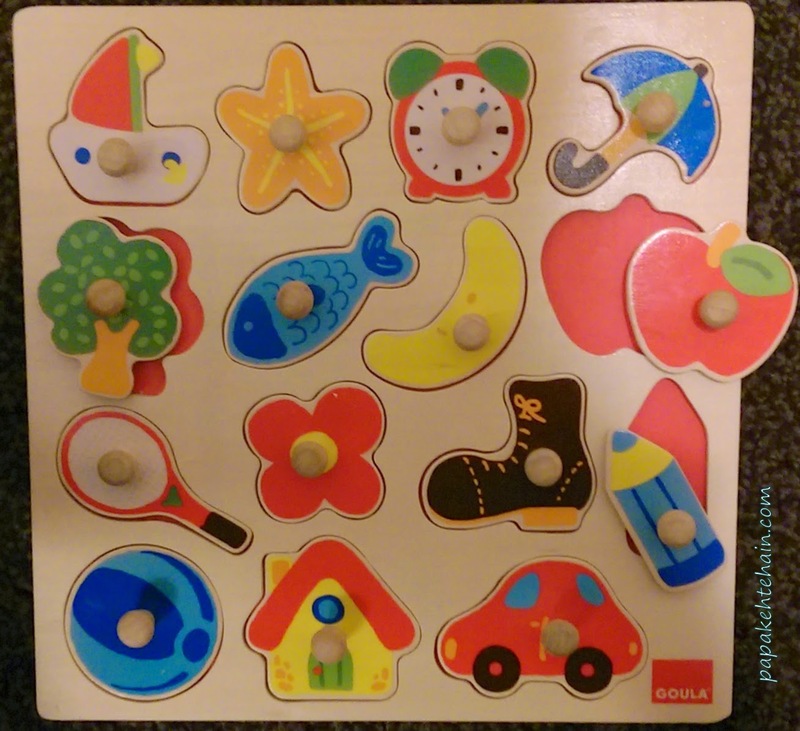 This single puzzle can help you teach your baby numbers, shapes, colours and time.